When Nureva launched two years ago, company founders evaluated how enterprise team members collaborated and brainstormed, and they found many people plastering paper sticky notes on conference room walls. Nureva then wondered: How could digital sticky notes on a large virtual canvas benefit the collaboration process? With that, Nureva Span was born. Nureva's ideation management system features wall-mounted panoramic projectors that cast images and other content onto a wall. A touch module, mounted below the projector, floods infrared light onto the wall so users can move the images on the wall with their fingertips. Each projector casts a 10-foot-by-4-foot virtual canvas, creating an expansive collaboration space, especially when more than one projector is used. This "bigness" differentiates Nureva from other large-scale collaboration workspaces, said Nancy Knowlton, Nureva's CEO. While some flat-panel displays have infinite whiteboard canvases, Knowlton said users can lose their work in that type of environment as they swipe an image off screen and start drawing another. "We like bigness but try to constrain it so people have an understanding of where they are," said Knowlton, who co-founded SMART Technologies, a company that makes interactive whiteboards. Nureva couples its hardware with cloud-based software so remote users can share their ideas to the virtual canvas via their personal devices in real time or asynchronously. Users can upload digital sticky notes, photos, sketches and other marked-up images. Users can also save and share content, and access a virtual canvas through Chrome and Safari browsers or via apps on iOS and Android tablets. Typically, like other immersive collaboration workspaces that aim to organize brainstorming sessions, Nureva's customers include product design companies and architectural firms. Knowlton said Nureva hasn't yet found a limit to the number of users that can be included in an ideation session, although the company has had between 40 and 50 users at one time. Nureva Span and other large-scale collaborative workspaces help organize brainstorming ideas in real time, said Irwin Lazar, a Nemertes Research analyst. "The real problem these applications solve is brain dumps," he said, "when you're trying to collaborate in a group and people are throwing ideas over the wall." 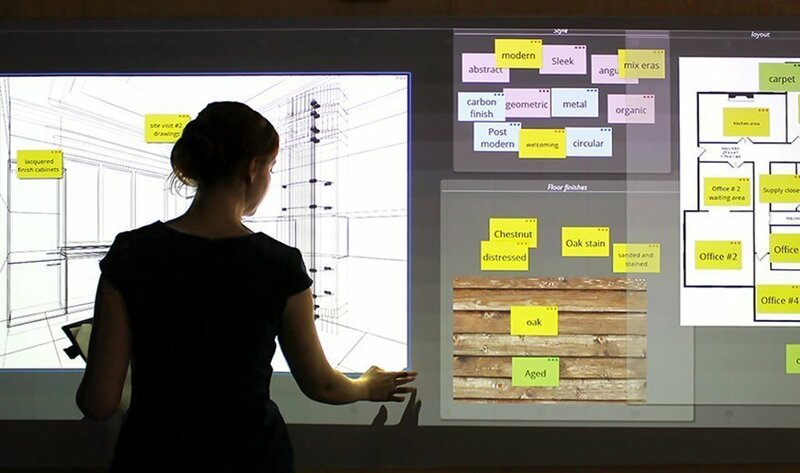 Photo: The Nureva Span ideation system features a virtual canvas, digital sticky notes and touch capabilities to help organize brainstorming sessions. How could digital sticky notes help your brainstorming sessions? We used to use physical sticky notes on a huge whiteboard, before we had so many remote team members. We now use the free online site Ideaboardz.com in a similar way.